Located at Joshua Tree Lake Campground, the 3-day Joshua Tree Music Festival endorses creativity, community empowerment, and arts education for all ages. The event promotes personal growth through a variety of multidisciplinary workshops, such as yoga and movement, visual arts, music, and myth. Nestled against the Copper Mountains with sweeping views of the National Park, the 40-acre, privately owned venue is an ideal locale for the intimate festival. Set from May 18th-21st, the event will feature music by domestic and international artists such as Dirtwire, House of Hamsa, Orgone, Netherland’s Kraak & Smaak, Korea’s Jambinai, Zimbabwe’s Mokoomba, Marques Wyatt, and Friday headlining artist Liberation Movement. Led by Resurrector of Heavyweight Dub Champion (HDC), Sasha Rose, Noah King and supported by members of the Shipibo Tribe, Liberation Movement is a new collaborative music project that pushes the boundaries of human experience. Each Liberation Movement performance is a communal ritual that opens portals to the realm of spirits and invokes new levels of consciousness and healing. In 2010, Resurrector traveled to Peru to learn about how music and vibration are connected to shamanism. This led to collaborating with Alianza Arkana, a Peruvian-based nonprofit working with the Shipibo people, on a concert and performance to 600 indigenous Peruvians alongside 2 shamans. Thus Liberation Movement was born, seeded at the Temple of the Way of Light in the Peruvian Amazon, where Resurrector was recruited to work with and create recordings of shamans in traditional ceremonies in Peru. Their Joshua Tree performance will be recorded and integrated with their Peru footage to further expand on their narrative. “The festival line-ups are diverse. We look for artists on the rise; the wildly talented dream chasers who deliver passionate performances as if their lives depended on it. Many artists have performed here as unknowns, and now have thriving music careers, such as: Brett Dennen, the Avett Brothers, Trombone Shorty, Deer Tick, Edward Sharpe & the Magnetic Zeros, Trampled by Turtles, Carolina Chocolate Drops, Ghostland Observatory, California Honeydrops, Greensky Bluegrass, Gene Evaro, Valerie June, Orgone and many more,” says Festival founder Barnett English. The event will also feature visual arts with 3D and interactive murals, installations, sculptures, LED light wall, woodwork, swing set decor, metal artwork, and a story circle. On Sunday there will also be a Live Painting and Silent Auction with over two dozen artists in participation, with half the proceeds going to the artists, and half to a children’s music program. Yoga classes will be offered from sunrise to sunset, with 39 classes by 15 instructors over 3 days.​ The Healing Oasis will include varied types of healing modalities, such as massage, sound healing, group meditation and tea service. There will be presentations held in the Sanctuary area, a circular earthen bench space created for conversational gatherings, mindfulness talks, and hanging out. Several talks will be held throughout the weekend, with Andrew Ecker speaking on Friday and Sunday. Andrew was born to the Apache (and Irish), and has facilitated workshops in multiple disciplines for the Havasupai, Navajo, Hopi, Yaqui, Tohono nations and more. Andrew dedicates his life to bridging cultures and sharing ancient tribal ways. He is also a contributing author to Jamaica Stevens’ “ReInhabiting the Village” book. Executive Produced by Keyframe-Entertainment, the graphically rich 352-page softcover book offers a roadmap and blueprint for building a legacy for our future through the shared development of social technology tools, innovative templates, models, permaculture guidelines and resources that are useful to communities everywhere. As a self-described family friendly global music experience, the Kidsville area features daily kids’ activities, whose Family Camp offers attendees the chance to be around more families, and a quieter space after hours. Kids 10 and under attend the festivals for free, and young ones aged 11-16 get in for half price. 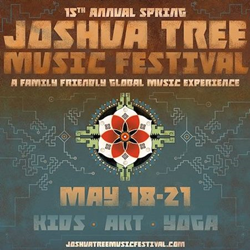 Joshua Tree Music Festival is a bi-annual May & October event, with its October event set for October 5-8. The festivals are a celebration of life, lovingly produced by a family of friends and funsters who believe that music is the soul of life. For more info and tickets, go to: http://www.joshuatreemusicfestival.com/tickets. Founded in 2003, the bi-annual (May & Oct) Joshua Tree Music Festival is held at the gateway to the world-renowned National Park. The festivals are a celebration of life, lovingly produced by a family of friends and funsters who believe that music is the soul of life. JTMF is a resource-generating powerhouse of passionate creativity, community empowerment, and arts education for all ages. A family inclusive global music experience in the magical Mojave. Committed to radical inclusion, these three day (and four night) funky desert-style festivals create experiences where passion, purpose, family, and friends come together, and the boundary between performer and patron is blurred.